China became part of my life when I met and married Edgar Snow. I had read Red Star Over China long before I knew the author but the years that followed were largely devoted to my acting career in New York. China was rather remote from Broadway. Through Ed, I developed close relationships with his friends and colleagues. Agnes Smedley showed me how to cook “oriental pilaf,” something she didn’t learn in Yan’an; Ed and Jack Belden speculated about events in China, past and present, over frequent games of chess in our home. I became friends with Mariann and Edmund Clubb and Caroline and John Stewart Service. Owen Lattimore fascinated me with his tales about Inner Mongolia. There were also letters from friends in China, but reception was complicated by the U.S. postal service’s requirement that mail from Communist China be acknowledged in writing before it was delivered (probably having been opened and recorded—no doubt the same occurred in China). At home in the 1950s we saw our American friends targeted by the McCarran Committee, Joseph McCarthy, or more discreet members of the U. S. leadership. There were supporters, but people were afraid of losing their careers, their livelihoods. From years of reporting, the name Snow was closely associated with news about Communist China, those two words a “red flag” to editors and publishers in general. Gradually Ed found it harder to get published. Because of my marriage but also because of my support for civil rights and other causes, I became blacklisted on television, a main source of an actor’s income. With reduced savings, two children to raise, alimony to be paid, an offer to Ed for a position with a school traveling in Europe and Asia became a temporary lifesaver. We rented our house, and the children and I accepted the use of a friend’s summer home close to Geneva, Switzerland. After months abroad with the school, Ed received word from China that he would be welcome to visit. The State Department, and Secretary of State John Foster Dulles, reacted negatively but a persistent Gardner Cowles of Look magazine overcame the “impediments.” In 1960 Ed flew, legally, to Beijing—a lone American journalist and a single one as well, the State Department having refused my request to accompany him. In 1964 Ed went back. Again my request was denied. In 1970 I didn’t ask; I went with my husband, carrying a contract to write a book on Chinese theater from Bennett Cerf at Random House. I also carried worry. Ed had not sufficiently recovered from a serious operation in the spring. He was weak and fatigued but he was adamant: we were going. My first glimpse of the country, entering through Hong Kong, was from a modern, air-conditioned train operated entirely by women. Serving us mugs of hot tea, they were as eager to talk to us as we were to talk to them. From the train window I watched leathery buffalo, elongated heron and shimmering green rice fields dotted with farmers, birdlike in wide winged coats and peaked straw hats. Ed was impressed by evidence of farm mechanization new since his last visit. When we arrived at Beijing’s airport, I felt the awe of entering the Land of Oz. Having heard and read about people in China who had participated in events that shaped the country from the 1920s to the present, I knew they existed but like Ozma and the Tin Woodsman—could they be real? They were. During our five months in China, I met them in Beijing, Shanghai, Canton [Guangzhou] and other cities and rural areas as we traveled to many different parts of the country: old friends, Chinese and foreign, Long March veterans, once-upon-a-time “Little Red Devils” in the Red Army, women whose crippled feet had been bound, peasants in remote communes, factory workers, doctors (barefoot and shod), actors, ballerinas, musicians, women engineers, women film directors, Red Guards, coal miners in universities, intellectuals and university students doing unaccustomed manual labor far from city comfort. Ed, knowing conversational Chinese, could talk with many of them directly. In an account of his 1960 visit he said that he was not given any “clairvoyant power to enter into their private thoughts” and that “at formal interviews, there was generally an official or an interpreter present, and nobody bares his soul to either one, especially with a foreigner around.” Nevertheless, he noted: “I think I know more about all these people than I could possibly have understood had I never returned to China.” For myself, I felt that I was learning something each day. It wasn’t Oz. It was a huge country still trying to emerge from the effects of the Cultural Revolution. Admittedly, my first visit to China was a special one. It began early on with an invitation from Premier Zhou Enlai for us to accompany him to a ping-pong match between North Korea and China at the enormous Beijing gymnasium where, some months later, the China-U.S. ping-pong matches created international excitement. At a pre-dinner gathering in the Great Hall of the People, prominent members of the political hierarchy included some whom Ed remembered from the early days in Yan’an. We dined with Song Qingling in her lakeside Beijing home, where she greeted us warmly, Ed being an old friend. I saw her often on later visits. Zhou Enlai’s wife, Deng Yingchao, concerned about Ed’s health, kept in close touch. One day I received a gift of sunflowers from her garden (I planted the seeds at home when I returned to Switzerland). An uncomfortable moment was my first meeting with Jiang Qing, whom Ed hadn’t seen since 1939 when she had become the young wife of Mao Zedong in Yan’an, the Communists’ headquarters for ten years before they entered Beijing in 1949. Introducing me, Ed remarked that she and I had much in common: “you are both actresses.” Jiang Qing’s face froze. She practically spit out, “I am NOT an actress!” (I retired behind Ed.) Nevertheless, she was indisputably head of the new “revolutionary model” theatre, therefore of great importance for the book I was to write. Five revolutionary “model” operas and two ballets comprised the whole of the Chinese theatre at that time and she, Mme. Mao, was in charge. The plots were pure political propaganda, simpler than fairytales; the actors trained in classic Beijing opera adapted to a modern, if stilted, stage technique replete with stunning acrobatics. Heroes were indefatigably heroic, villains were fabulously villainous—quite a different approach for me, a member of New York’s Actor’s Studio. There was also quite a bit of music, all Chinese; foreign composers like Beethoven and Mozart were politically taboo. Children’s dances and songs made up a different kind of entertainment, the little ones well trained and adorable. Standing there I became aware of two particularly striking things (beside the fact that I was so close to Mao Zedong I could have touched the mole on his face). A vivid impression was the sense of worship rising from the mass of people below on the square, people screaming—just like with the Beatles, Sinatra, Michael Jackson—so it was with Mao Zedong. My attention then focused on a huge sign bearing the words, “People of the world unite to defeat the U.S. aggressors and all their running dogs.” Why were WE there, two Americans, side by side with the Chairman, before millions of Chinese citizens—and that sign? Afterwards Ed reminded me that the Chinese never do anything publicly without a reason. One December night we were awakened by Nancy Tang, Mao’s chief interpreter who, seeing a sleepy Ed, said “Please get dressed. The Chairman wants to see you.” It was during that midnight to near-dawn “conversation”—as Mao termed it—that the significance of our presence on the Tiananmen balcony became clear. We were the signal that Nixon could come to China. It took some time for that to sink in at the White House. All along, Ed was unwell. Weakened by the operation in the spring, he had insisted on going to China by ignoring or putting up with pain and fatigue. Our Chinese companions urged us to take a week or two relaxing at the seaside resort of Beidaihe. Ed declined, saying that it would take too much time. Fixated on getting to basics, he wasn’t always patient with excessively long discussions of different versions of the Cultural Revolution. Once he slipped me a note on which he had written “Mao said Keep Meetings Short”! We spent a week at two of Beijing’s prestigious universities, Tsinghua and Beida, listening to students and professors recount tales of Red Guard fighting and upheaval on campus during the height of the Cultural Revolution. Ed was concerned by a lack of forthcoming from people he had known who were justifying or covering up an unclear situation. Friends were evasive: when asked the whereabouts of a particular couple we had expected to see, the answer was, “They’re taking a trip, they’ll be back soon.” A revealing reply was “Better not bring that up.” An old Chinese acquaintance politely declined an invitation to come to our hotel for a visit, though others did come. But discretion, and caution, were obvious. Not until later did the hidden underside of the Cultural Revolution become fully revealed, and reticence—even among friends—become understandable. Concerned as I was about Ed’s health and his determined efforts to get to the bottom of past and present events, I was excited by the China I was seeing: the Forbidden City, the Summer Palace, the Ming Tombs, and the thrill of actually being on the Great Wall. I walked the wide, triple tree-lined streets of Beijing teeming with bicycles, watched the Little Red Soldiers—boys and girls too young to be Red Guards—standing at street corners and shouting through a microphone: “Don’t cross on red lights!”, “Use pedestrian crossings!” On a free hour it was fascinating to wander around narrow back lanes whose walls protected courtyards and low-roofed homes. A two-hour drive to Miyun dam north of Beijing on a tree-lined, paved road (trees were everywhere) took us past fertile countryside, orchards, tree nurseries and into villages with brick or mud houses, a primary school, fat pigs, and electricity supplied by the dam, which meant water and irrigation for the formerly arid area. After visits to communes in Xi'an and Yan’an, and a May 7th school where a Beijing professor was tending a strikingly clean pigsty, we were driven to Bao’an, the remote village in northern Shaanxi province where Ed had been in 1936 when it became the Red Army base after the Long March. It had been a desperately poor place, with a few ragged peasants scarcely able to feed themselves or their naked, unschooled children. The autumn we were there, Bao’an, a commune brigade, held some 3,000 citizens. A “model” opera was playing in the large theatre, the main street was lined with houses, cave homes dug out of the loess hills, a well-stocked general store, a handicraft shop, a power plant and a dentist’s office beside a small hospital. Goats and sheep grazed on the hills. We ate in the open with the people who had produced a special feast: corn on the cob, sweet potatoes, spicy chicken, melon and fresh fruit. Children ran about, people, young and old, gathered and stared. We and the village were on display. Bao’an’s general population looked amply fed and healthy. Still far from the amenities of modern life (I knew that by going to the “toilet”), they had pulled themselves up to achieve a decent, if frugal, standard of living. I had picked up a few Chinese sayings, among them “ziligengsheng,” meaning “self-reliance.” The emphasis on self-reliance was born out of the struggle of a poor but proud nation to overcome the isolation imposed by Japanese invasion, the support America gave Chiang Kai-shek during the Chinese civil war in the 1940s, and the U.S. economic blockade of many years following the Communist victory. It was how China sought to recover from such deprivation. I concur with what Mark Selden wrote in this series about “the imperative to understand other countries in light not only of their own history and culture, but also of the workings of global power, particularly American power.” On that first visit (there were quite a few more), whatever displeased me or made me uncomfortable was mainly due, I felt, to my totally different life experience. I hadn’t grown up hungry or illiterate, had never worked long hours in a factory, never labored in a rice paddy or gone without needed medical care. As an adult I had expressed opinions freely, voted for my choices, protested publicly, chosen my preferred career. Escorted through a rug factory where scores of women bent silently over work as we smilingly passed by, I was surprised to see one young woman deliberately staring at us with obvious hostility. I sympathized with her (I can still see that look). I had to remember what or where she might have been before the revolution: a child working thirteen hours a day and sleeping under the workbench, a famished prostitute roaming city streets, an impoverished mother of undernourished children, a foot-bound slave to a domineering mother-in-law? China had overcome much, and there was much still to overcome. Bao’an was a good example. There were other examples of overcoming, especially in the countryside. Differences were plentiful: medical care with barefoot doctors in remote areas, schools in communes, free education, free means of birth control, physical transformation of the ancient soil, and as Ed pointed out, for the communal group, not for private gain. That was 1970. Yes, there had been the Great Leap Forward with its tragic aftermath, when hunger had once again been a scourge, but since then almost-forgotten places like Bao’an and Shashihyu and others we saw had made noticeable progress. If crop yields were sometimes exaggerated, women’s roles somewhat overstated or statistics unproven, sturdy stone and brick houses, reclaimed green fields and orchards gave evidence that hard work had made life better than ever before. When we were shown the best homes, those of families with a bicycle, perhaps a radio or a sewing machine, they pointed to what could be a similar future for others less advantaged. It was apparent that some units and some people could move ahead faster because of their own skills or possibly simply by hook or by crook. Communism didn’t guarantee equality or honesty any more than democracy does. Help came with a medical team—three doctors, four nurses, an interpreter—sent to our Swiss home by Mao Zedong, Zhou Enlai and their wives. They undertook the needed care, eased the pain, softened fear in the face of death. The difference was not better Chinese knowledge in treating cancer, it was in an attitude unlikely to be found in a busy hospital most anywhere. In our home, they had time and the ability to comfort, to care. Everyone in touch, friends nearby and abroad, our village neighbors, were affected by these men and women who had come to help. Our thanks poured out to them and to those who had made this gift possible, one I shall never forget. Thus ended my first trip to China. Years have passed, people have died. In 1989 the Tiananmen massacre shocked the world. I broke with the Chinese leadership. I no longer visit, though my son and I made a special, and short, trip in 2000 to express sympathy and support for Ding Zilin and the families of all those who, while participating in a peaceful demonstration, were murdered or severely injured by soldiers of the People’s Liberation Army following orders from the country’s leaders. In 1949 Mao had said: “China has stood up.” In 1989 Chinese citizens were shot down while trying once again to stand up. Ding Zilin’s teenage son was killed the night of June 4th near Tiananmen while he was searching for a schoolmate; his mother has courageously and persistently called for an investigation of the massacre—so far to no avail. We were prevented from seeing her and the treatment my son and I received was, to put it mildly, far from cordial. Tiananmen was an outrage. Since then, learning nothing from that horrendous crime, the Chinese leaders have stepped up their persecution of peaceful dissidents and outspoken activists, intensified human rights abuses and multiplied unlawful arrests, imprisonments and forced disappearances. There is an increasing gap between the newly privileged, mostly urban rich and the still needy poor, a flagrant misuse of the judicial system and an absence of previous guarantees of livelihood. 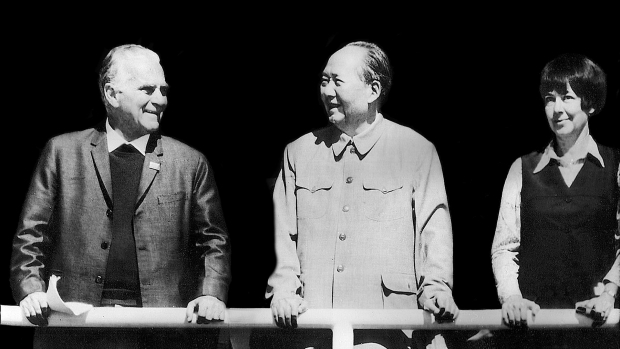 I strongly feel the Chinese leaders misuse Edgar Snow when they praise the man who, at personal risk, broke through Chiang Kai-shek’s blockade and brought word of the outlawed revolutionaries to the Chinese people and the world. The government promotes Edgar Snow as a model. Any Chinese journalist knows full well not to write about whatever the government does not want investigated or revealed. In 1936 Ed made a trip to an area forbidden of access by the regime in power, that of Chiang Kai-shek. Doing the equivalent with the present government would mean years in prison. To protest peacefully is dangerous, as Nobel peace laureate Liu Xiaobo found out—eleven years in prison. Wei Jingsheng spent fifteen years behind bars and is now in exile. Wang Dan and other student demonstrators at Tiananmen were jailed and exiled. The Tiananmen Mothers, headed by Ding Zilin, are under direct surveillance and are not allowed to publicly mourn their dead. At this writing, the noted Chinese artist, Ai Weiwei, has disappeared. At present, if you were truly to emulate Edgar Snow in China you would be in deep trouble.